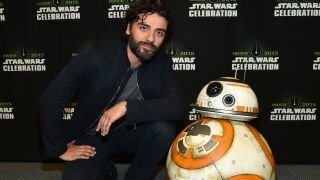 Long before Poe Dameron joined the Resistance to fight The First Order, the X-Wing pilot played in a succession of ska punk bands under the Earth name Oscar Isaac. That’s right, Poe – alright, alright… Oscar – was a member of Florida ska punk bands Petrified Frogs, Closet Heterosexuals and The Worms. Check out him in this clip of The Worms performing at Ray’s Downtown Blues Bar in May 1996. He’s the skinny bassist in the white vest and cap. It was while attending the University of Miami School Of Music that he formed The Blinking Underdogs with his friends. The sextet – whose line-up was completed by Nick Speck (bass), Bill Sommer (drums), Alan Mills (trombone), Keith Cooper (saxophone), and Matt LaPlant (guitar) – were influenced by the likes of Reel Big Fish, Goldfinger and Fishbone. During a recent interview on Jimmy Fallon Live!, it was revealed that his band even opened for gruff Massachusetts legends The Mighty Mighty Bosstones. The band released their debut album Last Words in 2001 before the band went on hiatus as frontman Isaac journeyed north to study acting at New York City’s Juilliard School. He’s since gone on to star in 2013’s Inside Llewyn Davis, 2014’s A Most Violent Year and will appear in X-Men: Apocalypse this summer. Still, there’s always the chance that JJ Abrams could reunite the band for a scene in Maz Kanata’s cantina during future instalments of the intergalactic saga. But only a fool would bet on that. You can listen to a collection of The Blinking Dogs’ demos and studio recordings at the Internet Underground Music Archive.